Pay what you want for this $1,590 Microsoft Office training bundle! If knowledge is power, then knowledge of Microsoft Office is a superpower-especially when it comes to your resume. Master the essentials-pay what you want for the A to Z Microsoft Office Training Bundle at Escapist Deals. Pay what you want and you'll get training on Microsoft Access and One Note. Beat the average price and you'll get eight more courses, so you can master Access, OneNote, Excel, Word, PowerPoint, and Outlook. You'll become a bookkeeping and information management expert, learn how to analyze data, create sleek documents and presentations, finally tackle your inbox, and learn how to easily keep track of notes and ideas. These are all skills that will help you at work, ensure your team gets more done, and impress hiring managers. 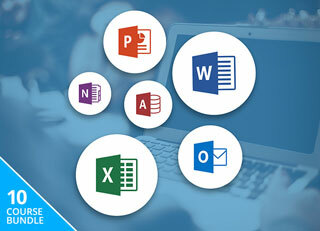 Pay what you want for the A to Z Microsoft Office Training Bundle at Escapist Deals.